Radiant Floor Company will provide a detailed worksheet for your project explaining the amount of tubing in each zone, the spacing, gallons in the floor, heat loss, pump size and setting etc. and this is used in conjunction with our installation manual, installation video and website information. 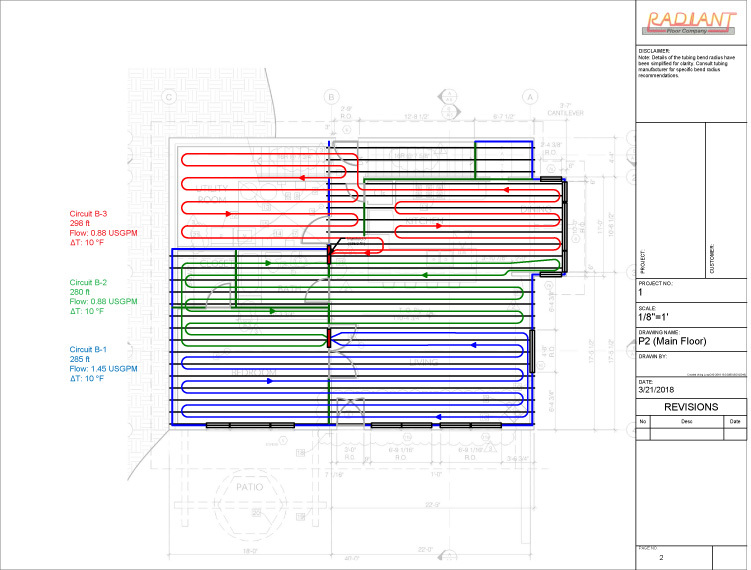 We can also provide drawings to assist with your pex installation, We will (however) need scaled drawings for both the slab and floor joist installation. These drawings are used a guide, as you may make modifications to better field fit, if needed. See below for more details of this service. Because the joist framing is so complex, unconventional buildings like geodesic domes require equally elaborate tubing layouts. This layout demonstrates the extremes some people will go to enjoy the benefits of radiant heat (actually, this is the third floor of Radiant Floor Company’s new office building). Note the color coded circuits, the varying joist lengths, the way the joists constantly change direction, and the central pentagonal beam that forces the tubing into tight little quadrants. Wow! Thankfully, most installations are a lot easier than this! General tubing installation is discussed in detail under the Floor Joist Installation heading. However, we have found that a tubing layout, drawn to scale on your blueprints, can be a very useful tool. 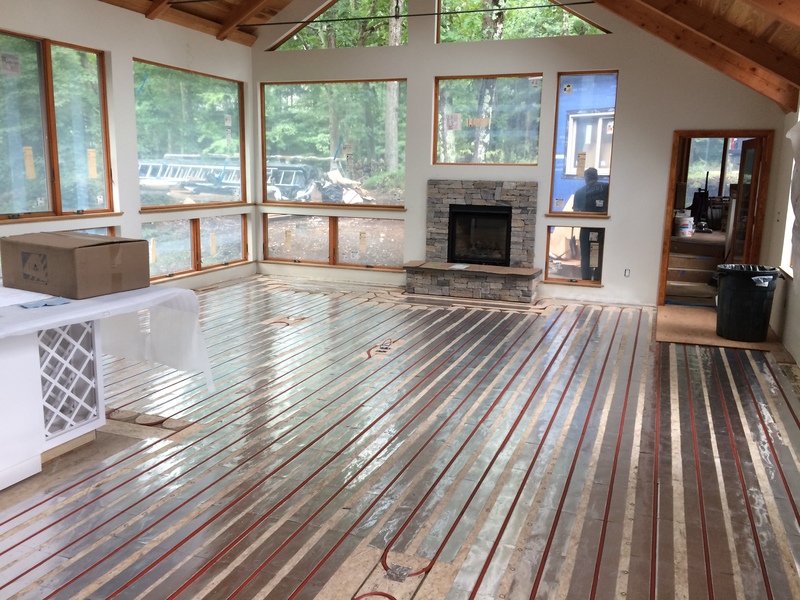 A layout provided by Radiant Floor Company offers the installer a visual overview of the radiant system, zone-by-zone, circuit-by-circuit, which becomes a map to guide you through the job. 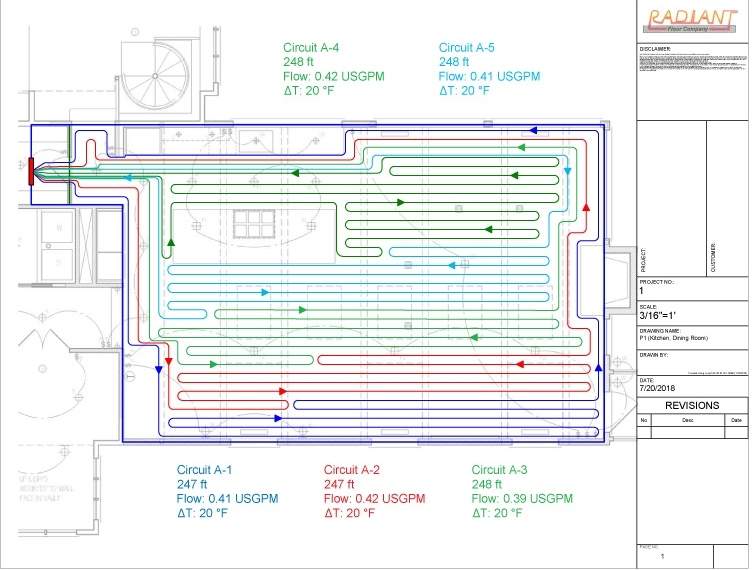 Even before the first length of PEX is unfurled, the installer can see the circuits within each zone and plan out the best header or manifold locations. Of course, it’s important to realize that even the best layout map should be used as a helpful aid only and that conditions specific to each jobsite should determine the ultimate layout. For example, sometimes the joist systems the carpenters actually build differ slightly from the joist pattern on the architect’s blueprint… and even a minor deviation from the blueprints can affect the tubing layout. Fortunately, the tubing is flexible enough to adapt to these “real world” modifications and, as a result, minor variations of the floor plan rarely cause problems. The important thing to remember is this: the installer should be as flexible as the tubing. In other words, always allow the realities of the jobsite to determine the ultimate tubing layout. Because building projects constantly change and evolve, our technicians work with you to guarantee that all zoning information is current when the layout is drawn. Color coding each zone makes reading the layout that much easier. Below is an example of a beautifully completed above floor project, based on the tubing layout on the left! The following are tubing layout examples of Above floor, suspended slab, sleeper, floor joist, and slab on grade installations. Radiant Floor Company provides a complete system design based upon the specifics of your project. The free Zone Calculation Worksheet supplied with your quote breaks each zone down into its vital components, i.e. how much tubing per zone, how many circuits, number of diffusion plates, pump size, manifolds, etc. In addition, our technicians are available 45 hours a week to answer questions and guide you through the install. 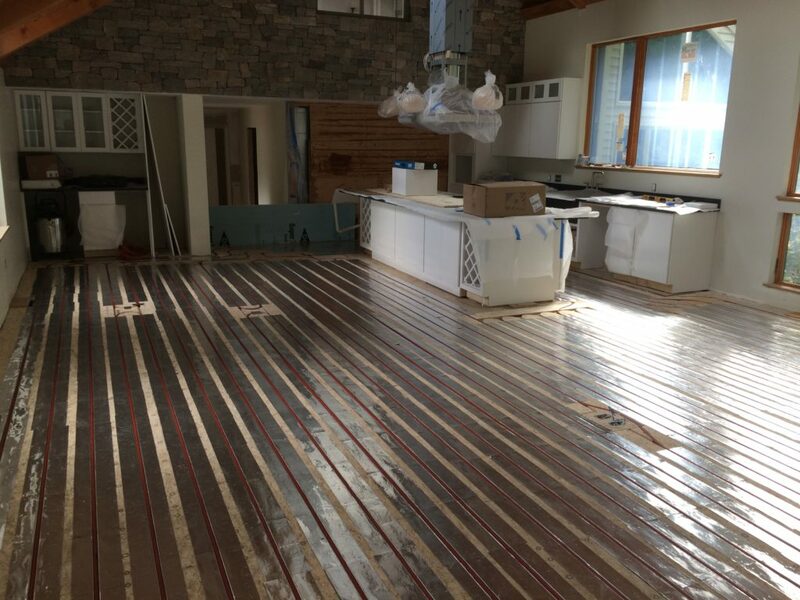 A tubing layout is just one of many tools available to help the do it yourselfer complete a successful radiant heating system. As a result, many installers plan their own layouts based upon the system we’ve designed for them. Others prefer to send us their floor plans for a full-scale layout design. The choice is yours. 1. A .09 cent per sq .ft. fee is charged for our layout service, assuming a standard 16″ or 12″ on center tubing spacing (As an example, a 2500 sq. ft. home would cost $225.00 for a complete tubing layout. This could be a slab layout, a layout for floor joists, a suspended slab, a ledger system, or any combination of the above). For installations with high heat loss where double tubing is required, i.e. 8″ on center spacing, an .11 cent per sq. ft. fee is charged. 2. We encourage full sized plans with a ¼” = 1′ scale. (Plans scaled smaller than this make using the drawing very difficult. I’m sure you can imagine the nearly unreadable jumble of lines, representing hundreds of feet of tubing, that would crowd together on an 1/8″ scale drawing). 3. An additional fee of $25.00 will be charged if our map technician has to “scale-up” or redraw a floor plan sent to us in a smaller format. Note: Please double check any information submitted to us. A layout drawn from misinformation only results in a lot of wasted time, money, and effort. We’re pleased to offer this service and greatly appreciate it when our customers work with us by adhering to the above guidelines.